It is important for a garden to enjoy a visually appealing watering can. Personally, I recommend yellow because it reflects all kinds of nutritious light. My watering can will support enough water to straighten out your back every morning, when we make three trips to the balcony to fortify precious plant matter. After channeling my agrarian ancestors and consulting Dr. Frankenstein, I made some things happen. OMIGAHD! Can you believe it? Me neither! Clockwise from the left are Dad's dwarf gladiolus, impatients and what I believe to be a hydrangea, a mix of lettuce and tomato plants. Here are the marigolds, pansies, miniature roses and impatients. This is why I get up in the morning, to see what they are doing! BIG FUN during coffee. La la la, I'm growing stuff...with my bare hands...la la laa. See how that works? I wonder how I found out about white light... Oh yes, I remember! It was on Goog, after I typed in "reflectors for plants" and came upon a golden cache of growing information supplied by pot farmers. Those people have a point, because I've already eaten the tomatoes growing on reflected light, while the tomato plants in the sun have yet to ripen real fruit. Yay for pot farmers! They knew that white relfects a full spectrum of joy! Look at that lusciousness! There are two tomato plants in conventional pots in the foreground, which are growing like cray-zay, but this stand is something I am proud of. It came with cheap plastic legs that bowed, and so I had to hammer in shower rods for support, to keep this thing from falling to it's death four stories below. More than one hundred pounds from that height means Mojopost would have an extreme insurance liability. Boo! We hate liabilities! But we love growing our 'maters. 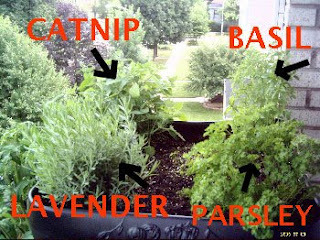 What you cannot see, because of the intense foliage, is that nine cilantro plants are maturing between the lavender and basil. There is salsa in my future! I love this. The results from the last Mojopoll (What is your favorite time of day?) indicate chronic insomnia. Me too! At night I can turn off my filters and contaminate the Interwebs in peace. However, I also enjoy mornings because I don’t need much sleep. Like you, I am uncommunicative until I have coffee and the resulting bowel movement, but after that we can be friends again. The new poll (on the right) was inspired by a moron practicing Kung Phooey at the Indiana Dunes on Sunday. I’m going to call him Chi Chi the Cheetah, which may or may not mean he is directly related to this hot mess on Wikipedia. Black belt? Are you shitting me? Chi Chi was working on his martial arts moves at the beach with props that included his Okinawan kobud weapons (nunchucks, as they say in junior high school), some knives and daggers. If he was any good I might have tipped him a fiver, but Chi Chi was all thumbs. He was smacking himself in the head, dropping stuff and tripping. The lifeguards were not concerned but – gee – I was. I’m weird like that, when clumsy poopheads are running full-tilt-boogie with sharp objects in their hands, while little babies are trying to build sandcastles. Obviously, I had to take a picture. Chi Chi hissed at me, but the other guy on Wikipedia says he likes audiences. On a related vanity website, you can view videos. After the photo op, I asked a park cop if nunchucks and daggers were allowed on the beach. “Absolutely not!” she said. I pointed to Chi Chi and, eventually, a big fat park cop came by in a go-cart to shoo him away. According to Wiki some people feel it is important to be a “...freedom fighter who fights for the freedom of expression when and where the audience exists.” If he keeps throwing freedom around like that someone is going to lose an eye! I don’t know what is wrong with me. I never woke up one day and thought about working on my Black Mamba death squad moves on the shores of Lake Michigan. Usually I just bring snacks and tanning lotion.